An image from a Nintendo teardown shows the heart of the Wii U. Remember the days when your idiot friends would argue with you in the schoolyard about how "blast processing" made the Sega Genesis a better system than the Super Nintendo? Or how the Nintendo 64 was twice as good as the Sony PlayStation because it had twice as many "bits"? Or how the Wii's processor was no better than "two GameCubes stuck together"? Here in our new, enlightened age, I thought we had left such context-free numbers games behind like so many other childish arguments. But no, in 2012 people are apparently still obsessing over how a single spec number makes one console wholly better or worse than another. Today's bit of myopic number-crunching is based on the findings of Wii hacker (and now purported Wii U hacker) Hector Martin, who last night tweeted claims that he had discovered the previously unknown clock speeds for the Wii U's tri-core PowerPC 750 processor (about 1.24GHz) and the AMD Radeon-based GPU (about 550MHz). The Wii U's CPU clock speed number is indeed lower than the Xbox 360's 3.2GHz clock (although the 360's gets halved to a functional 1.6GHz when multithreading) or the PS3's 4GHz clock. The GPU clock speeds are more comparable across the PS3, the Xbox 360, and the Wii U. Still, plenty of reporters jumped on that fact as undeniable evidence that the Wii U hardware is actually inferior to that of consoles that came out years ago. We usually have to wait for a new piece of hardware to actually be on the market before we can link to the obligatory teardown showing the internal components. But Nintendo has beaten the iFixits of the world to the punch this time around, hosting an official, picture-filled discussion of the Wii U's internal hardware as part of its regular "Iwata Asks" interview series more than a month before the system hits stores. 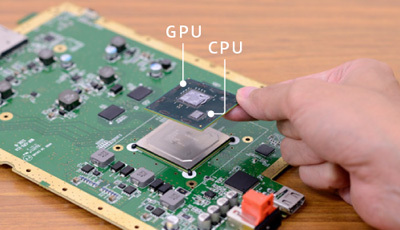 Nintendo's focus is the Wii U's multichip module (MCM) which contains both a multicore CPU and GPU along with on-chip memory, all on a single substrate component. Positioning all of these chips so closely together reduces latency and power consumption, the Nintendo engineers explained. This in turn keeps the size of the hardware down, a priority for the team. Despite the advantages of the MCM design, combining components from chip-makers Renesas (RAM), IBM (CPU), and AMD (GPU) on a single component was a challenge. When defects became apparent during the testing process, isolating which piece of the MCM was responsible proved tougher than with a more spread-out design. When the component manufacturers would insist that another company's chip was responsible for problems, Product Development Deputy General Manager Ko Shiota said he forced each company to design a robust testing regimen to "prove your own innocence." Nintendo's focus is the Wii U's multichip module (MCM) which contains both a multicore CPU and GPU along with 2GB of on-chip memory, all on a single substrate component. Positioning all of these chips so closely together reduces latency and power consumption, the Nintendo engineers explained. This in turn keeps the size of the hardware down, a priority for the team. 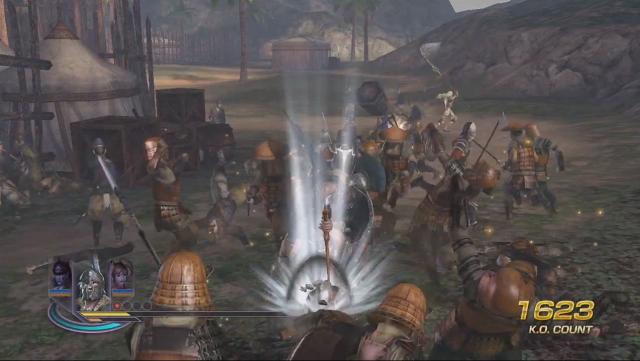 The kind of enemy-filled scene that the Wii U CPU has some trouble with, according to Warriors Orochi 3 Hyper producer Akihiro Suzuki. In the many months we've been hearing about Nintendo's Wii U, there have been wide-ranging reports that the machine's underlying hardware is comparable to or somewhat more powerful than current generation HD consoles. Now, as we get closer to the system's November 18 North American debut, a Wii U launch developer suggests that it might actually perform worse than current generation systems in some ways, while improving on them in others. Speaking at this week's Tokyo Game Show, Warriors Orochi 3 Hyper producer Akihiro Suzuki told Eurogamer that the Wii U's CPU power is actually "a little bit less" than the Xbox 360 and PS3, leading to some specific drawbacks in the Wii U port of the game. "When you have a lot of enemies coming at you at once, the performance tends to be affected because of the CPU," he said. "Dealing with that is a challenge." Nintendo hasn't revealed precise performance details of the Wii U's IBM-made CPU, which features three Power PC cores, but Suzuki's comments line up with those of other developers contacted by Eurogamer last month. "We are not limited by [the CPU power] but some other games might suffer from it," one unnamed developer told the site. The Tendo Project – Daily Nintendo News is powered by	WordPress 5.0.4 and delivered to you in 2.394 seconds using 41 queries.